In a world of mega this and mega that, oversize this and supersize that, it’s nice to know that there are still some wonderful hideaways that focus on individuals and on creating a personalized vacationing experience. 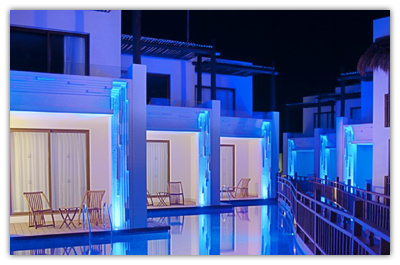 Such is the case with Karisma’s Azul Beach Hotel, an intimate resort focusing on great service, style, and originality. Geared toward couples and families, the Azul Beach Hotel caters to all age groups and provides excellent variety, quality, and personalized service. The all-inclusive Azul Beach Hotel is situated on the beautiful Petempich Bay near Puerto Morelos, just 15 minutes south of Cancun Airport and 30 minutes north of Playa del Carmen. This central location places you within reasonable proximity to the natural aquarium of Xel-Ha, Eco park Xcaret, Tulum, beautiful golf courses such as Puerto Aventuras Golf Club, and cenotes for diving throughout this region. The resort is small and personal, and each room is only a few minutes from the beach, pool, restaurants, and all other facilities. Enjoy restaurants, swim-up bar, lounge and bar. Seven full service swimming pools. There is an onsite fitness center, and you can also get a massage, manicure, and pedicure at the beach. The guest rooms at the hotel are decorated in a contemporary Caribbean decor and come in Deluxe, Jacuzzi Ocean Front Junior Suite, Jacuzzi Ocean Front Junior Swim Up Suite, Honeymoon Suite, Honeymoon Swim Up Suite, Wedding Suite, Wedding Swim Up Suite, Azul Suite, Jacuzzi Junior Suite, Jacuzzi Swim Up Junior Suite, Family Suite and Family Swim Up Suite categories. Room types include king or double/queen beds, air conditioning, satellite flatscreen television, DVD player, balcony, and minibar. Dining is meant to be an important part of your Azul Beach vacation. The restaurants offer a variety of cuisine including international, Asian, Italian, Latin American, and contemporary. A la carte dining is the standard for breakfast, lunch, and dinner. Low fat, low carb menus are available, as is 24-hour room service. Destination weddings are popular in the Mexican Riviera, as are honeymoons and anniversaries. 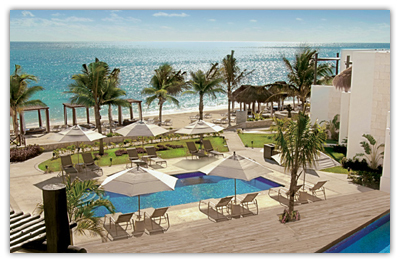 The Azul Beach Hotel can assist you with planning all these events. Enjoy many different activities by day and live music and shows in the evening. Sightseeing is fabulous. Visit the towns of Playa del Carmen, Puerto Morelos, and Cancun, the islands of Cozumel and Isla Mujeres, the natural parks of Xcaret and Xel-Ha, and the Mayan mysteries at Tulum. The Mexican Riviera and the Azul Beach Hotel are hand-in-glove destination partners and form the perfect combination of scenery, surf, sand, sun, personalized service, quality accommodations, and sheer enjoyment. You won’t want to go back home!